Progress continues on my Ceil Chapman project. Instead of adding a lining to an already intricate design, I decided to go the easy route and underline as suggested by the instructions. 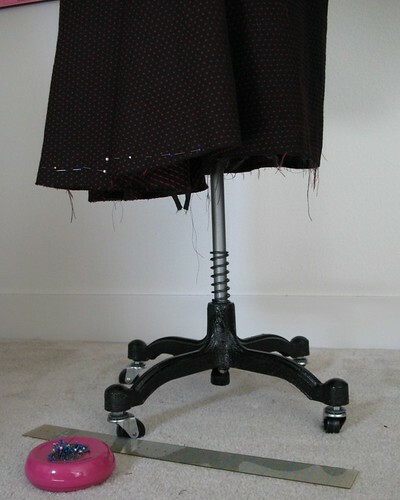 The back skirt drape, which I initially thought was tacked on top of a fitted skirt or attached with a belt, turns out to be part of the actual design and held at the center back with two internal “lining” pieces. I do not agree with the description, and would consider those pieces a "stay" to help the soft pleats remain in their proper place. 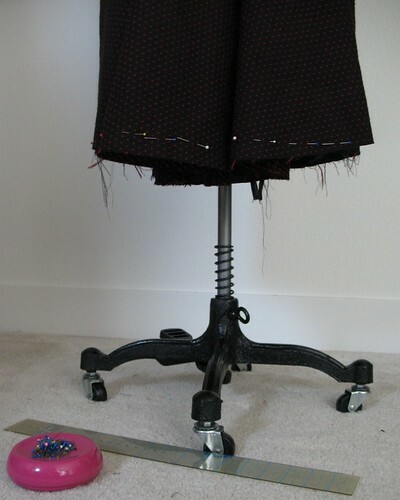 After living on my dress form for a couple of days, the pleated section started to drop (not very surprising as it is cut on the bias). 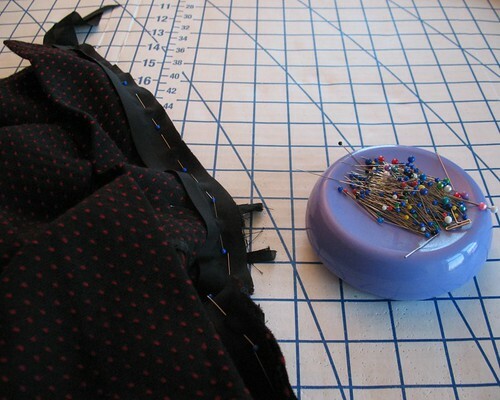 I find straightening a hemline to be a tedious process, so doing a bit here and there in between more interesting parts of construction helps to make it less painful. 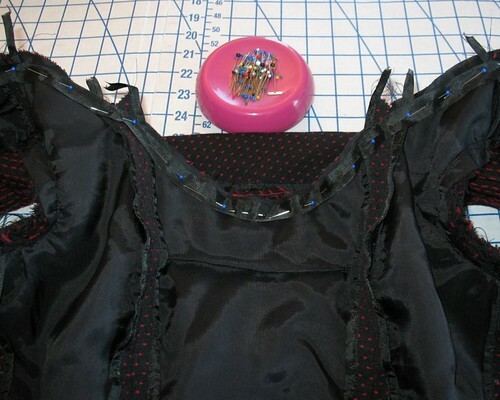 To keep the bodice lining neck edge from stretching, I added a length of seam binding and stitched just inside the seam allowance. 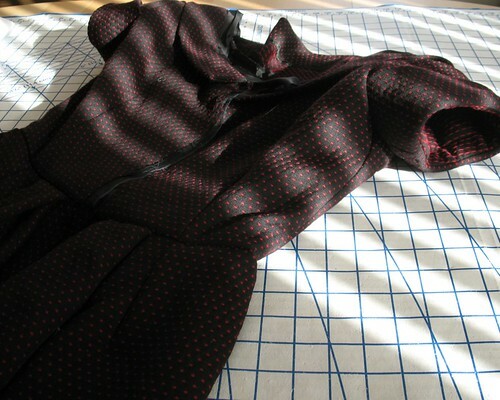 And I ended up replacing the given neckline facing with a bias strip of my bemberg lining. This midweight wool is probably a little on the heavy side for this design (the sleeves were my first hint) so adding more bulk with a wool facing did not seem like a great idea. 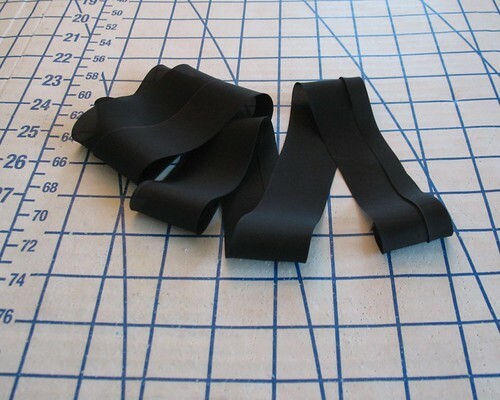 For raw edges that were too bulky for a single fold of seam binding, I used two. 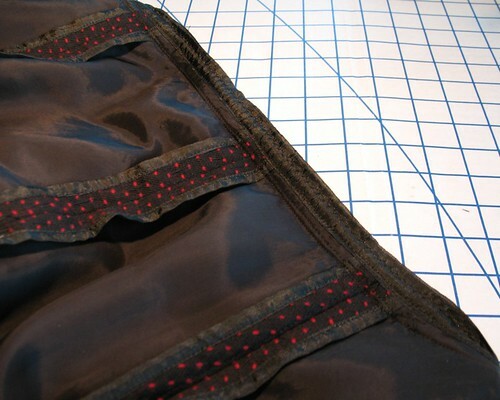 Two lengths were applied, one on each side of the seam, at which point the top edges were stitched shut with a zig-zag stitch. 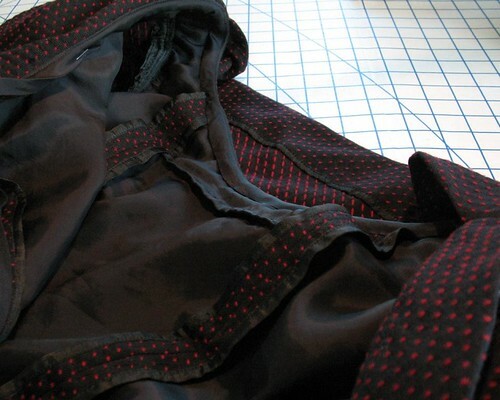 This process was used on the waistline seam as well as the armhole edges. This is really starting to look like a dress! Looks fantastic. I'm enjoying seeing it come to life. It is looking gorgeous! Looking forward to seeing you model it! Oh, it's looking beautiful!! That drape in the front is stunning. 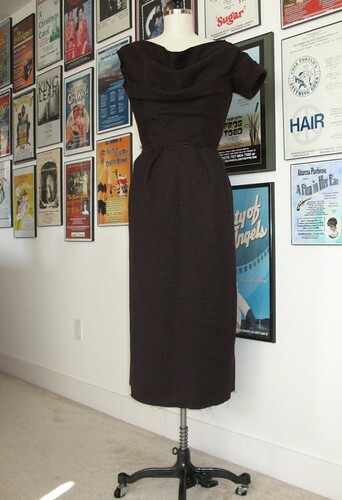 Goodness, that is a timelessly beautiful dress. Your choice of fabric (and colours) here is stellar - it adds to the natural cocktail/evening dress shape all the more. This dress will be beautiful! 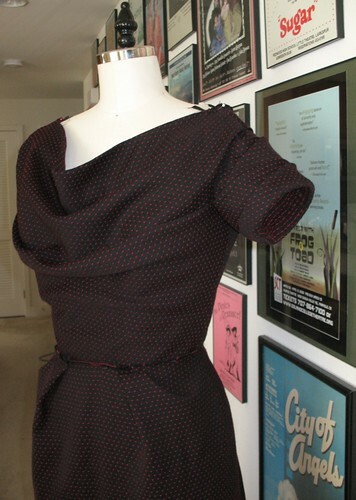 You are really inspiring me to try out more difficult patterns and give more attention to the garments I make! Spectacular, per your usual output! Time to trot out the, "It's so sharp, I'd wear it, and I'm a guy!" award. Laura Mae, please rock this frock downtown, or beside a vintage vehicle, or at another house with a cool staircase (the back story as to whomever you meet adds a serendipitous layer your readers crave - and yes, I am speaking for all of us). Hi Laura, love the dress it looks perfect. I love the fabric you used to, where did you get it? 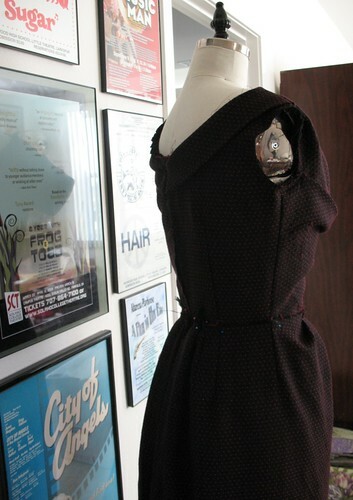 Thank you for showing the details as you make progress on this gorgeous dress. I really enjoy seeing and reading about the inside story.